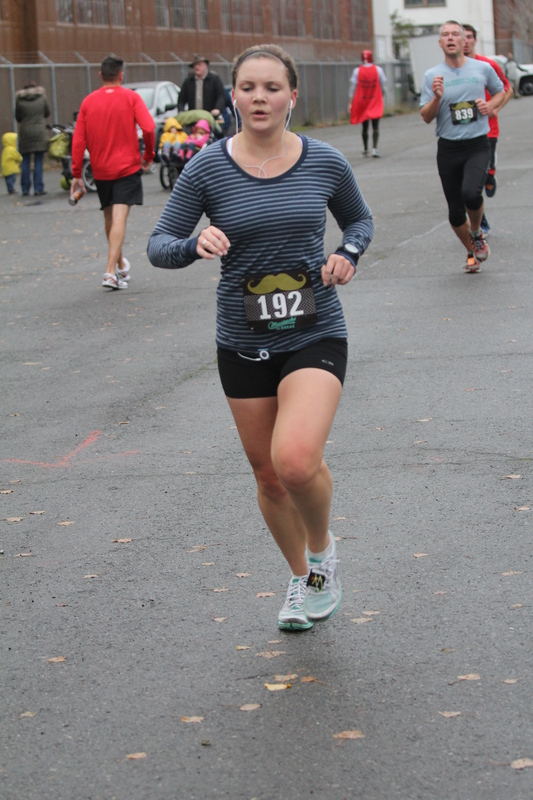 In the world of running races, 5ks are not really my jam. Honestly, I don’t love shelling out money for a race that’s only going to last around 20 minutes—and a race that is going to be super hard the whole time. Call it stingy, call it me being a baby…either way, I’m just not a huge 5k person. 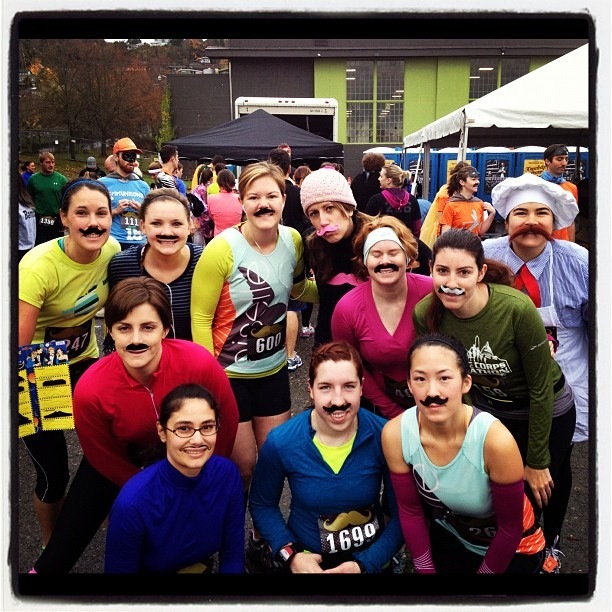 But, pair together a mustache-themed race and a whole bunch of Seattle bloggers, and I say game on. Which is why I spent Saturday morning clad in a stick on mustache (for a solid 5 minutes) with burning lungs. But I’m getting ahead of myself…let’s recap a bit shall we? The set up for this race was nothing short of hilarious. 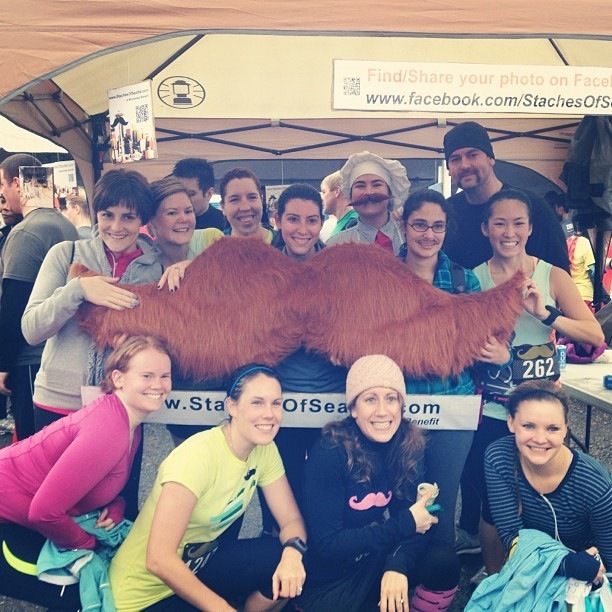 The organizers did a fantastic job with their mustache revelry and shameless promotion…which lead to a really impressive turnout for the race as well as some pretty amusing attire. Do you know how difficult it is to smile while wearing a press on mustache? REALLY hard. Photo courtesy of Sarah. It was a fun run for most everyone there, and while I intended to run hard, I didn’t have much of a methodology in mind. I had decided to use this as my “speedwork” for the week, so thinking of it as a standard workout helped my focus a bit. Going into it, I knew running anything below what I’d run during my last 5k (my PR) would be pretty difficult, and so instead of putting too much pressure on myself, my strategy was this: Go out fast, and try to hold on. And fortunately for 5ks, that method kind of actually works. While half-marathons and marathons always preach the negative-splitting technique, I’m realizing with 5ks it’s actually acceptable to run completely haphazardly with a balls-to-the-walls approach. I kind of like this, but I also kind of hate it. Because it took about .75 miles into this race for me to remember just how hard 5ks can be. My balls were at the walls, if you will, and they didn’t love it. When I took off, I was looking at a 6:30 pace on my watch. Which for me is fast. 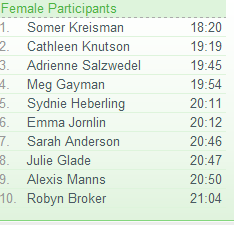 Probably too fast, but again—in a 5k, there are some shades of grey. Not 50 shades, but a couple. Anyway, my lungs started hurting pretty instantly. My stomach, which I had probably-not-so-intelligently decided to fill with a green smoothie an hour before the race, was also feeling a little uneasy. But, as I kept telling myself, this was about speed. I knew I had the endurance, and it was really about hanging on for dear life. So I kept hanging, watching my Garmin flash paces that I never normally see—and simultaneously my lungs argue in retort. I kept having visions of myself hurling up green liquid on the side of the course and racers thinking, “God it’s just a 5k, why are you so stupid and running faster than you actually can?” but alas…I kept pushing. Interestingly, my legs were never a problem in this race. They felt great the whole time actually, it was much more an issue of my breathing and my stomach. The great thing about the pain of a 5k, though, is that it goes by quickly. And lucky for us, this course was pretty easy-peasy. Very flat, fairly scenic (for such a short distance), and reasonably dynamic. A little pavement, a little dirt, etc. So I pressed on…forcing my pace to cling tightly to the low 7s. With a 300 meter-ish stretch with the finish line in sight, I was starting to rekindle my competitive spirit. I knew I would be finishing below my previous 21:43 time, but then I started to flirt with “Hmm, just how far under?” So I bolted, garnering all traces of oxygen from my raspy lungs and forcing my turnover to pick up. It helped that “What Doesn’t Kill You Makes You Stronger” was playing, also. Thanks Kelly. Bada boom, bada bang, and the run was over. Garmin stops, keel over, somehow managed my foot on a stool for my chip to be removed, hands over head, etc. But also a smile, a big smile. A 21:04 unofficial time was looking back on my watch face. A nearly 40 second 5k PR. And oh man, did I feel it. It took me a good 10 minutes before my lungs stopped burning, and even later in the day I felt a little wheeze in my breathing. Speed work I wanted, speed work I got. I got to then cheer in my fellow Seattle bloggers which was so much fun. They are all smarter than me and decided to enjoy running the race as opposed to making their insides bleed. I guess I can’t help it, or maybe I’m just that psychotic. After a few photo ops and gathering of all the free food (wonderful job with this Mustache Dache, btw), a few of us trekked over to brunch. I had it in my head that just brunch with these ladies would have sufficed on that rainy Saturday morning, but I suppose a 5k PR is nice too. As for the rest of Saturday…I scuttled off from brunch to get my hair colored (insert rounds of applause and gasps of shock here), and upon leaving the salon proceeded to rebraid my hair, tuck it under a baseball cap, and head out in the same 5ks clothes for some more rainy running. Did I mention I’m really bad at being a girl? 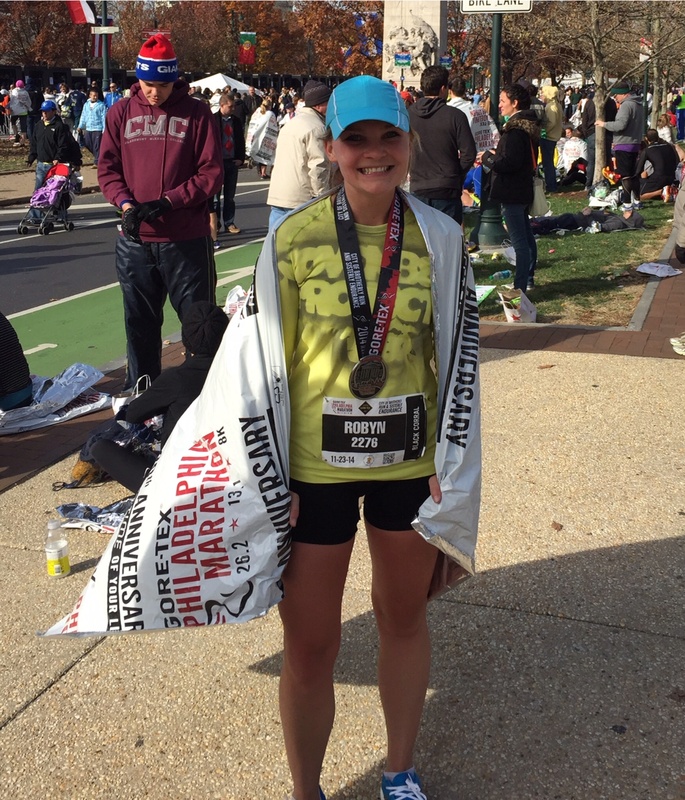 But don’t worry, my hair dresser is also a runner, so she didn’t mind the sweaty apparel. But back to the race recap. What did I learn from this? Well, my immediate reaction was that I don’t want to do a 5k for a very very long time, at least one that I’m actually racing. 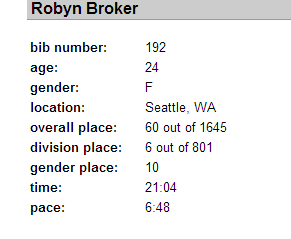 But with a new PR that’s just seconds off of a sub-21 time, I’m sure you can guess that I have a new goal in mind. So there you have it. A really fun morning with lots of blog friends with a 5k PR to top it off—and a finale of a big plate of brunch food. My kind of Saturday. So good to see everyone, and so nice to meet those of you I hadn’t met IRL yet! Happy Monday Wednesday because it’s a short week! Did you race this weekend? Brunch this weekend? Ruin your newly-minted salon hair this weekend? This entry was posted in Race Recap and tagged 5k, race recap, racing, running, weekend on November 19, 2012 by runbirdierun. Woohoo! 🙂 I love this race recap! It was so nice to meet you IRL and amazing job on the PR! Hey speedster…10th of all women that is awesome!! Great seeing you! That is so COOL!!! Congrats!!! I’m with you on the 5k…and I walked the whole way. But why pay money for a short distance when I don’t like going fast? BUT, you’re good at going fast! So while 5ks don’t make sense for me, I think they’re a great choice for you!!! “My balls were at the walls”. Haha! This had me laughing so hard. Congrats on a great race. I’m totally have the same feeling about 5ks. Although the less I do them, the less I remember how much I hate them!